1 of 2 In a large bowl, beat peanut butter, softened butter, confectioners sugar and vanilla extract until smooth. Roll into 1-inch balls and place on parchment-paper-lined baking sheets. Place in freezer for 30 minutes, until firm. 2 of 2 Melt chocolate chips per package directions. 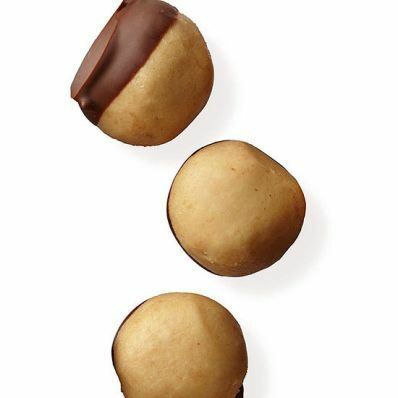 Using a toothpick, dip peanut butter balls halfway into chocolate, allowing excess to drip off. Return to parchment-lined baking sheets. With a moistened finger, smooth out toothpick holes. Refrigerate to harden chocolate; keep refrigerated until serving. Per Serving: 33 mg sodium, 2 g pro., 1 g fiber, 11 g carb., 2 g sat. fat, 4 mg chol., 6 g Fat, total, 101 kcal cal.